I just smoked my first shorty right off the truck. I'm super happy with these. They will do great with a little time. anyone else try one of these yet? How does it compare to the original Diesel? It's not really fair to compare right off the truck, but i'd buy a box of these again over the orig if they rest up the way I think thay will. Coming soon. Been one of those weeks. Mine will be at the office in the morning. Will smoke one sometime this week, then rest the remaining 4. Can't wait either. the beard said they were a bit more spicy. i wouldnt doubt him. not only that but given the blend and the change in the ring on this, it wouldnt even surprise me. again, i have yet to try either one but i have the original in the humidor and hope to try it soon. if i like it and the feedback here is good ill go on and get the shortys. I'd go with them being a bit more spice. I plan on smoking a reg then a shorty to compare some time this week. Maybe even a review on WBfiller. I got mayyyybeee a hint more spice, but really, it tasted like all the regular Diesel's I've smoked, which isn't a bad thing, since I really enjoy them. Same flavors to me - leather, spice, espresso, natural tobacco. To me, this one had a better burn. I used the large punch on my Bugatti lighter, and the draw was effortless. Not loose, just right. I enjoyed it, but the second half did get a little bitter, which I'm attributing to it being fresh off the truck after a 5 day ride. I'll put the others in the humi for 8 months or so, and I think they'll be really good then. Had one last night. I loved it. Everything was better than I would have expected. Slightly more spice than the original. Great draw, lots of smoke and probably the best burn on any stick I've smoked. Atleast top 3. Lasted a good hour and enjoyed every minute of it. Like Joey said I can't wait to fire one up in a few months. I had one last night and I wasn't super impressed with it. Can't really put my finger on it but the stick seemed stagnant and kinda boring. I should try one with more time on it later. I had a Diesel Stout last night which is a 6x60, a buddy of mine go the chunktastic 6x60 sampler from the other site and it has 4 Diesel Stouts in it. It was freaking awesome is all I have to say!! I cannot believe they do not sell this vitola separately! Seemed to me to taste very similar to the original Diesel but with a lot more flavor and bit more of a buzz! Burned nice and even and very cool, I have to get some of these! I don't know if I am going to even try the Shorty. I love the Unholy Cocktail and, everything else being equal, find myself preferring torpedos, belicosos, etc over robusto, toro, etc w/ round ends. Because of this I can't imagine prending the same amount for a box with 6 less sticks of the Shorty. If they get the 5ers eventually down to what the UHC 5ers go for, I might try one, but I'm not rushing out to be an early adopter on this one. For those who have not, try the Shorty. I reviewed it on Ubi, and it was really good. I like this immediately over the Unholy Cocktail. I think it might have a bit more ligero? Not sure, but it has a bit more kick upfront. Flavorwise, if you took the UC flavor profile, and just added layers, it's like that. There is everything, but more so. I agree with the bitterness, smoked a pair and each got a bit bitter toward the end but some rest should cure this. I will be getting more of these for sure. Pictures are all up on the site, too. I too had one of these as I waited out a massive rain storm today at a friend's house. I was amazed at how peppery it could be without blowing my palate to Kingdom Come, and after the pepper it was just a phenominal smoke, and I too had bitterness in the final 3rd of it but I won't detract that from the overall enjoyability of this stick. Just had my first shorty. this thing is spicy all the way thru. just when i thought it was letting up it came right back. didnt have any burn issues. i have to agree by the time i got to the band it was a little bitter. got a few more resting , maybe it will get better. if you havent tried it. i recommend it! Had one this past weekend. It was awesome, to say the least. It's like a Diesel x 2. Great burn. Lots of thick chewy smoke. Smooth, yet very spicy (if that makes sense....). I like this one better than the Diesel, which I almost hate to say! Thanks to the BOTL who hit me with it in the cigar lottery. Much appreciated! wow, looks like it's getting some favorable reviews. Got one coming in a trade soon, can't wait. Got 10 of these little guys coming my way...I sure do hope I like them or they'll be going out as sniper rounds. It IS a Diesel, just a Shorty rather than an Unholy Cocktail. Noted. I'm sure a few will find their way out regardless, sneaky little guys. I just wanted to say. I've now went through about half of my box of these and love them. I wasn't sure ordering the box without trying a few first, but it was well worth it. I will be ordering more of these when I run out. I smoked a Shorty two nights ago. This was really fantastic. I'm very impressed - more so than the Unholy Cocktail. Funny thing is I didn't find it spicier like many others have said here. I found it more rich in flavor, and very, very well balanced. I've got 4 more, and sadly several of those are promised to a few guys here. heh, I'm starting to feel really protective of my last four! I had my first Shorty last night! What a great stick!! I did not find it spicier either. It may have gotten a little bit towards the end, but it was so good I burnt my fingers smoking it as far as I could! Perfect burn and draw with a punch cut. I believe the Diesel UC and Shorty are my 2 favorite sticks right now! I didn't get the extra spice either. But it's a really good smoke! Sadly, a few of mine snuck out in packages as well, and I only have two left. I see another order in my near future. I have to say, based on my experiences with the Shorty, everything that everyone on here thought seemed to come true. Bought a ten pack of these early last summer & couldnt wait to try them as I was a pretty big fan of the Unholy Cocktail. What a disappointment when I lit one up about three weeks later!!! The draw was super tight, the smoke was wispy, lots of bitterness and very little change in flavor profile for the half of it I smoked before I tossed it. Everything about this cigar screamed "GIMMICK!" at me, and I recently sent the remainder of them to Ozzie in a care package. Or so I thought! Was rummaging around one of my other humi's on Monday and stumbled across one, not sure exactly how it got in there to tell you the truth. I figured what the he11, might as well fire it up. 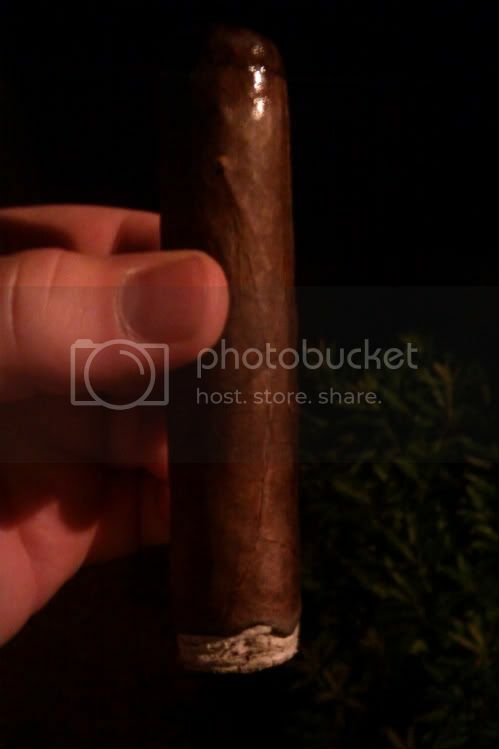 Effortless draw, razor sharp burn, and get this - one of the more complex cigars Ive EVER had! Whereas Ive found the Unholy Cocktail to be something of a one-trick pony (in that if you like the first couple puffs, then you will like the last couple & everything in between - all delicious, but very similar throughout), with months on them the profile and hints on this changed nearly constantly. Earth, cedar, cocoa, leather, a little booze, a fresh grassy sort of hint - from puff to puff, I didnt know what I was going to get, but it was seemingly something different (and AWESOME!) every time. I have to say I think age does MUCH better things to the Shorty than it does the Unholy Cocktail. In closing, as soon as I hit POST on this, I am going to go pick up another ten of these (or a box if I can snap em up at a good price! ), bury them in the bottom of a humi and forget about them totally. Amazing with some age on them gentlemen, simply amazing. I'm glad this post got bumped. I love the UHC and I thought the Shorty was just a UHC in a different size. Glad to know that it's even better than the UHC. I think I will have to visit this and the Unlimited soon.